Fashion With A Conscience has moved. Visit www.fashionwithaconscience.org: I'm officially a REBEL! I told you in an older post that I wanted to get a professional camera. Well the day has finally arrived! 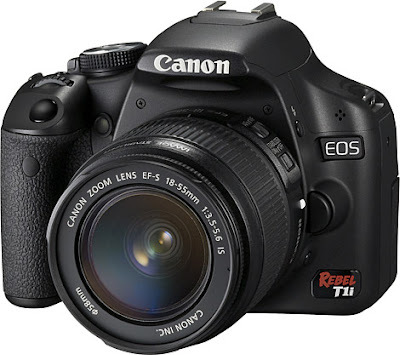 My Rebel T1i finally arrived in the mail last week! I am by no means a photographer, yet, but I like the idea of someday being a renaissance woman; able to write, shoot and edit videos, take professional photographs and so on... You see where I'm going with this, right? When I opened the package, I was a bit intimidated. I was afraid to break it or assemble it the wrong way. I instinctively more often then not, try to assemble things without reading the instruction manual. I don't know why I do that, it's just one of those things that I do! But thankfully for my non-instruction reading self, it turns out that these cameras are really user friendly and sturdy. When I mustered up enough courage, I assembled it and it went 1, 2, 3 ta dam! This camera is amazing. It shoots sharp photos and can also record videos! To baptize it I strolled down to the tents at Bryant Park. What better way, right? Yesterday was the last day of New York Fashion Week, which I'll be talking to you about next week. I have tons of photos from the shows and can't wait to share them with you! But in the meantime, here is the view from outside the tents. This picture was taken at night, obviously, a couple hours before the last show to ever be held at the tents: Tommy Hilfiger. Farewell Bryant Park! Love, Kelie Photo credits: Me!!! !